Which is the authentic Vesper cocktail? I’ve been enjoying Vespers for years, but only recently found David Wondrich’s intriguing speculation on the drink’s “original” flavor. The Vesper is one of my go-to cocktails, and is the standard accompaniment to our Friday evening sushi feeds. You would probably guess from such a pairing that my recipe is not the high-alcohol, quininesque “one, very cold” martini suggested by Wondrich (and, more famously, by Ian Fleming’s James Bond), but rather the lighter version that seems to be the standard among cocktail bloggers. Reading Wondrich made “authenticity” my ponderable of the day. There is no way to make this drink according to the original prescription—in that sense, it has returned to being a fictional creation—so the best we can do, and the thing that Wondrich has done quite well, is to select the attributes of the original that seem important in retrospect, and then simulate as best we can. You could speculate that the crux of understanding the drink is the vodka; the brand is strangely unspecified by Bond in the midst of otherwise complete product placements, what’s up with that? It seems that though Bond has spec’d a high-test gin for his drink, he’s also looking to tame its character considerably. So maybe he’s ambivalent about gin? Even ambivalent about vodka? Making flavor space for the Lillet? Or is it really about the bitter quinine tail of the Kina Lillet? Not one word of a hint on that. You pick your angles, and make your cocktails accordingly. We can drink approximations of the Vesper; we can drink simulations of the Vesper; but we can’t drink authentic Vespers. Is a non-quinine Vesper legitimately a Vesper? Common usage, the extinction of the original ingredients, and the convenient availability of well-accepted and under-specified replacements argue that it’s a moot point. The original is gone and won’t come back any time soon, and the widely accepted successor is a fine cocktail in its own right. I care about authenticity, but I’m thinking that in this case we have to give the poor, fictional, icy Vesper a little leeway in getting into the real world, a chance to avoid the briar patch of Bondish righteousness, and an opportunity to spend her time on the sunny paths of bright, open, and highly malleable cocktails. Stir, please, until ice-cold, strain into a well-chilled cocktail glass; express and garnish with a lemon twist. About the sushi pairing: there is a real opportunity in this pairing if you use a nice, bright gin that brings some citrusy freshness to the drink. 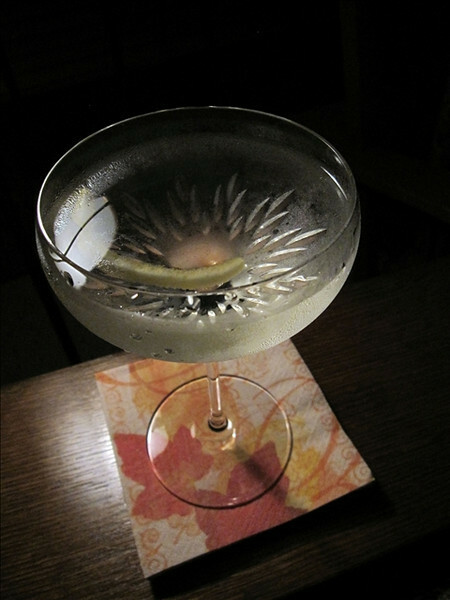 I suspect the Vesper would pair well with many Asian dishes—it balances well with ginger, wasabe, fish, and many spices. I’m working on a couple other sushi-compatible cocktails; they’re for another day. So what else should I be trying with next Friday’s sushi? “Which is the authentic Vesper cocktail?” at cold-glass.com : All text and photos © 2009 Douglas M. Ford. All rights reserved. My local store was out of Cocchi Americano, so I steeped cinchona bark pieces in Lillet Blanc until it tasted a little bitter. I’m not sure there was any point – it gets drowned out by the gin and vodka. I get the feeling that it smoothens the two, and you’d notice its absence more than its presence. To be true to the period I looked for a 100-proof vodka and ended up with a bottle of New Amsterdam. I’m tasting it a little more than I’d like. Nice idea, infusing Lillet Blanc. I’ve never tried that. And that’s an interesting way to characterize the effect of the bark—that you notice its absence more than its presence, sort of like salt in bread. I enjoy the New Amsterdam, but I’ve found it to be a bit sweet; I wonder if that’s what you’re tasting?